← A crime of passion. A lesson for us all. Hoo! Boo! And booyah, too! A seven-year-old ninja told her she was a hoot. Success! Stella fell in love with Halloween. She said “Trick or Treat” and “Thank you” and “Happy Halloween” at all the right times. She noted and appreciated everyone else’s costumes, even the less impressive ones. Like the dad whose costume was simply his regular jeans and flannel with an orange T-shirt featuring a simple jack-o-lantern face. “He’s dressed like a pumpkin.” Regarding the little girl dressed in an over-the-top gorgeous, homemade cupcake get-up? “She’s dressed like a cupcake.” Everyone was dressed like something, even if they weren’t, and Stella narrated every detail in an objective tone. She went trick-or-treating for about two hours. At stores and at houses and at the zoo. It was a very full and wonderful day. Honestly, I used to hate this holiday. I now adore it. Everyone fell in love with Stella’s costume. 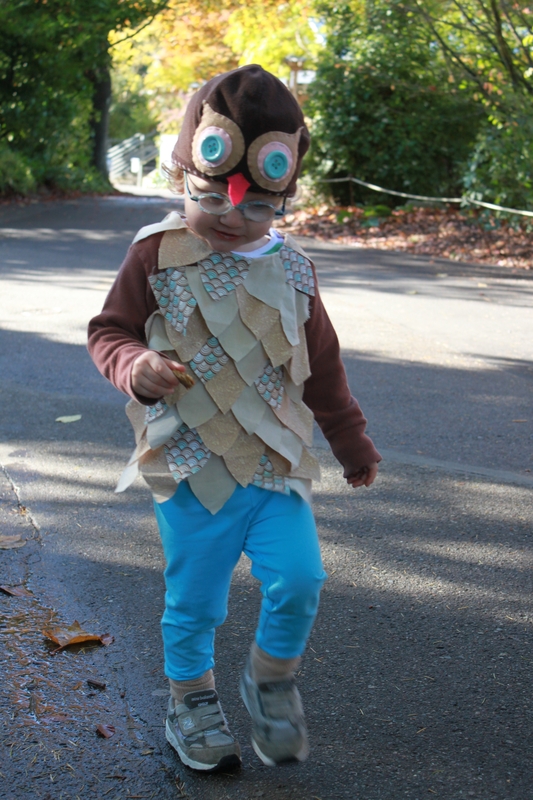 Which I made, thanks to fabulous inspiration found in alphamom’s “Last Minute Kids’ Owl Costume” post from last year. I’m kind of embarrassed at my level of pride. When asked if I made her costume, I’d absolutely exclaim with glee, “YES! I DID!” What can I say? It’s the most creative thing I’ve done in years. Along with our jack-o-lantern crew, which represented an organized, thoughtful creative collaboration with Cody. Involving brainstorms, sketches and check-in meetings. 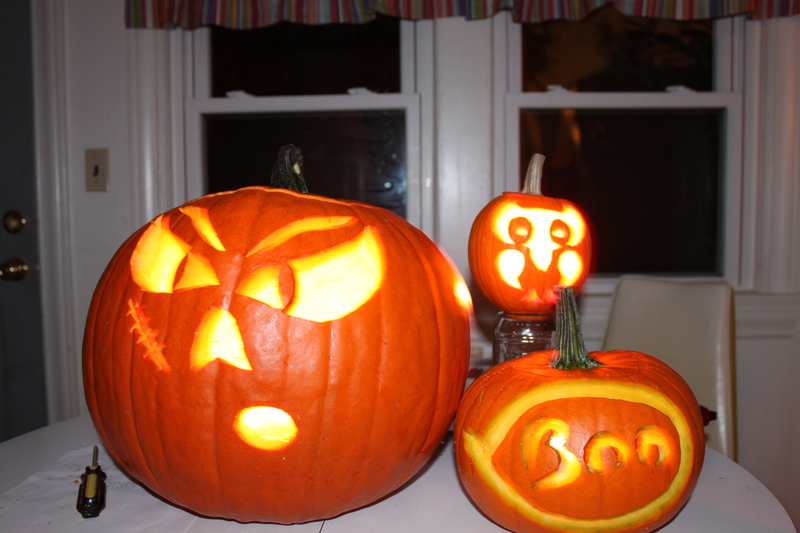 We should totally start an agency specializing in pumpkin advertising. I’m going resist saying it would be such a hoot. A new take on "boohoo"? Anyway, instead of an owl mask, which Stella would not tolerate for more than five seconds, I came up with an owl hat. I found a secondhand fleece Gap hat at a consignment store, removed the pom pom, turned it inside out to get a plain brown canvas, and crudely hand-stitched some buttons and pieces of felt to the front so as to create the owl eyes and nose. As alphamom suggested, I used fabric glue to attach the feathers to the shirt, because I don’t own a sewing machine and haven’t used one since middle school. Again, the sense of accomplishment I got from this was out of control. But the best reward was seeing Stella running around, flapping her arms and hooting in delight. Speaking of rewards, besides candy and owl-inspired antics, Stella’s vision therapy seems to be paying off. I just wrote a post about her recent breakthrough. So please check out my latest post on Little Four Eyes to learn all about quoits vectogram and the therapeutic value of owl feathers. Hope your Halloween was wonderful, too. This entry was posted in Milestones, Outings, Stella's eyes, toddler, vision therapy and tagged alphamom, halloween, little four eyes, owl costume, vision therapy. Bookmark the permalink. 1 Response to Hoo! Boo! And booyah, too! Cute cute cute!!! So proud of Stella’s excellent manners and your crafty creations, looks like a ball. And WOW on the 3D rope!!! Love it. We go in there for eye exam on Wednesday, will keep you posted.